I know we say all the time, that often it’s best not to put your sofa against the wall. For some rooms, you must, but it often works if you have an open concept room to put your sofa in the middle of the room. So doesn’t it look odd to walk in a room and see the back of the sofa? It can look funny, so one thing you can do is to put a sofa table behind the sofa. When we moved in, I didn’t have anything behind the sofa. You can see how the room looked with nothing behind the sofa, HERE. This post is sponsored by Calico. I have had this gray one behind my sofa for a long time. Another option is to put a two sofas back to back. I decided I really wanted to change things up, so I recently purchased a new bench to put behind my sofa. You might notice in the photo below that the table that was behind the sofa is now by the stairs. I’ll show you later where the table by the stairs went. 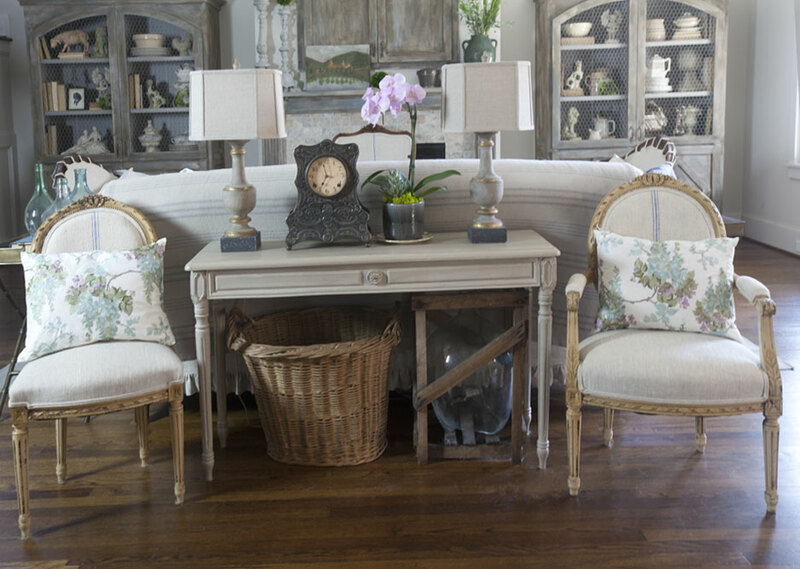 The bench is a new focal point when looking from the kitchen. It’s practical, since we set things on the bench when we are taking them to the car. It’s additional seating when we have guests also. 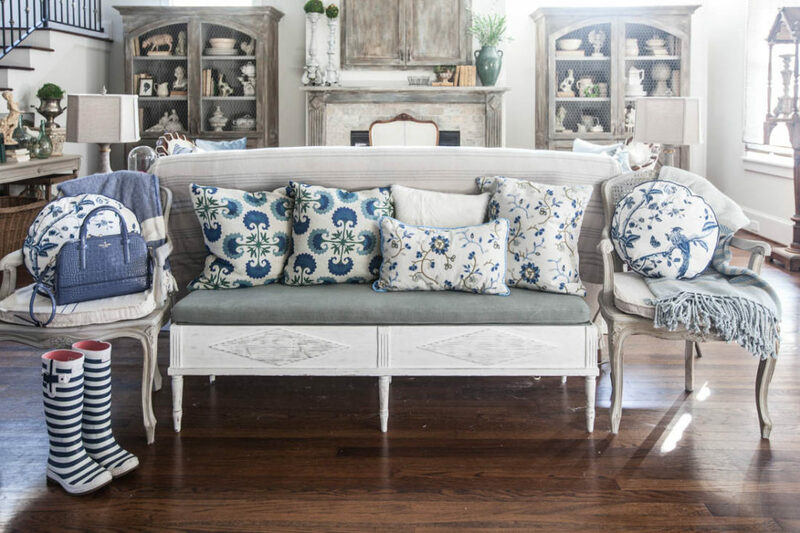 The bench also has storage underneath the cushion. I’ve topped the Swedish bench with pillows made from Calico fabric (excluding the white one.) 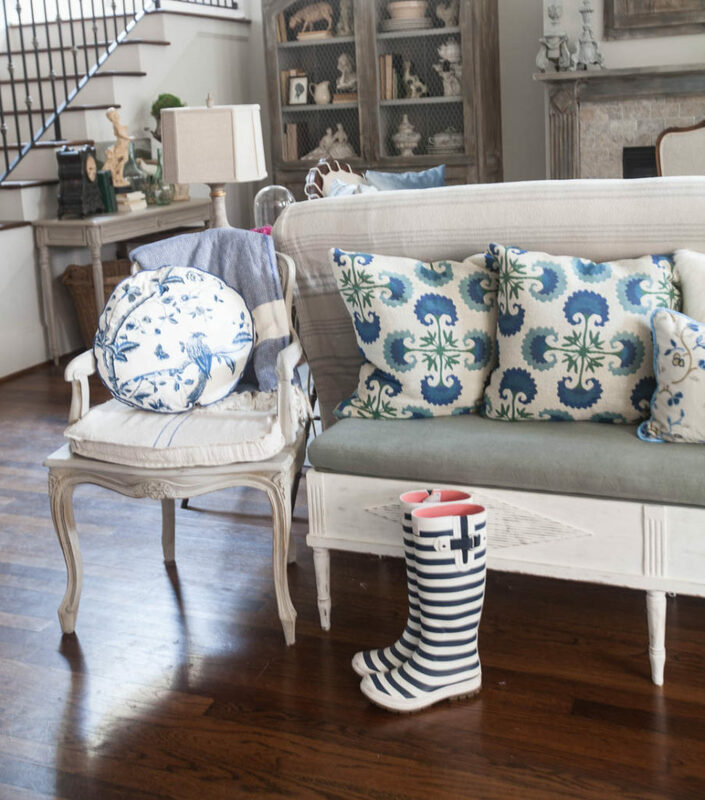 The fabric on the left is Crypton fabric from Justina Blakeney. It is liquid and stain resistant, so it’s perfect for everyday use. 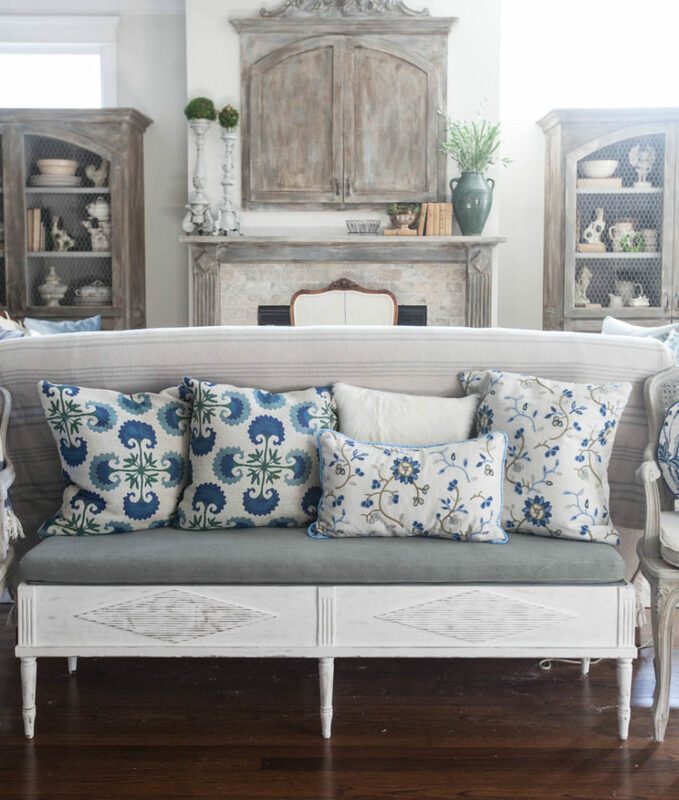 The fabric is Justina Blakeney’s Suz in Indigo, CLICK HERE. I also made counter stool slipcovers in the same fabric, CLICK HERE to see. 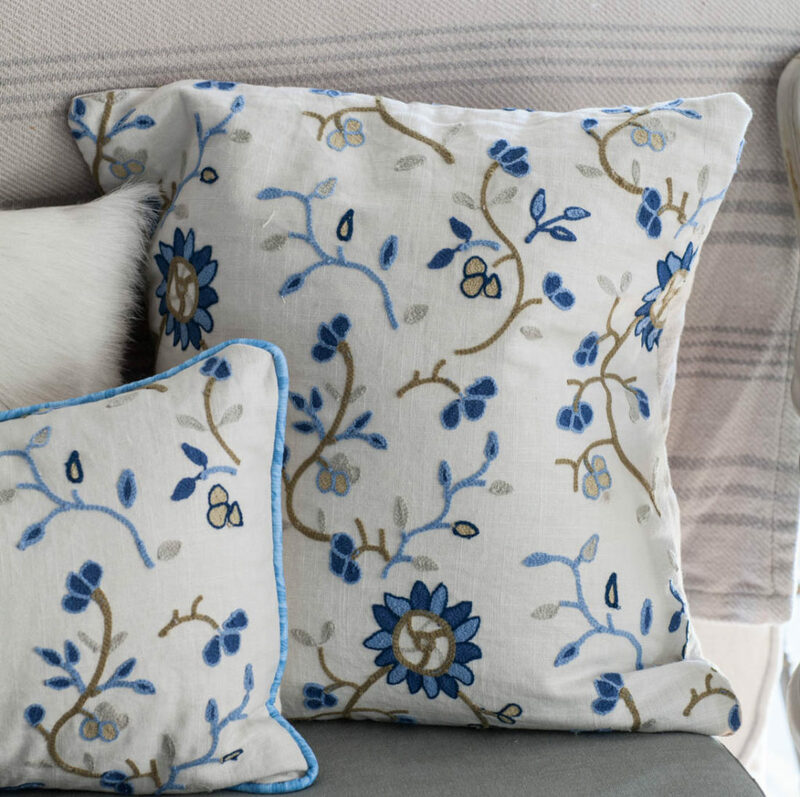 These pillows are also made from Calico fabric. I don’t recall the name of this fabric, but I found it at my local Calico. It’s worth a trip to your local Calico store to see what they have on hand. But if your store is not close, you can always order swatches online. My purse and wellies look right at home! Now the space behind the sofa is an usable as the space in front of the sofa. The downside to sewing is fabric fuzz on the floor. I feel like I am constantly vacuuming. My family doesn’t always comment on my decorating adventures, but this one is family approved. Since the sofa is often the most used piece of furniture in your living room, it needs to be arranged to work the best for you. Today on the podcast we’re sharing ideas for sofa arrangements. Love Calico! 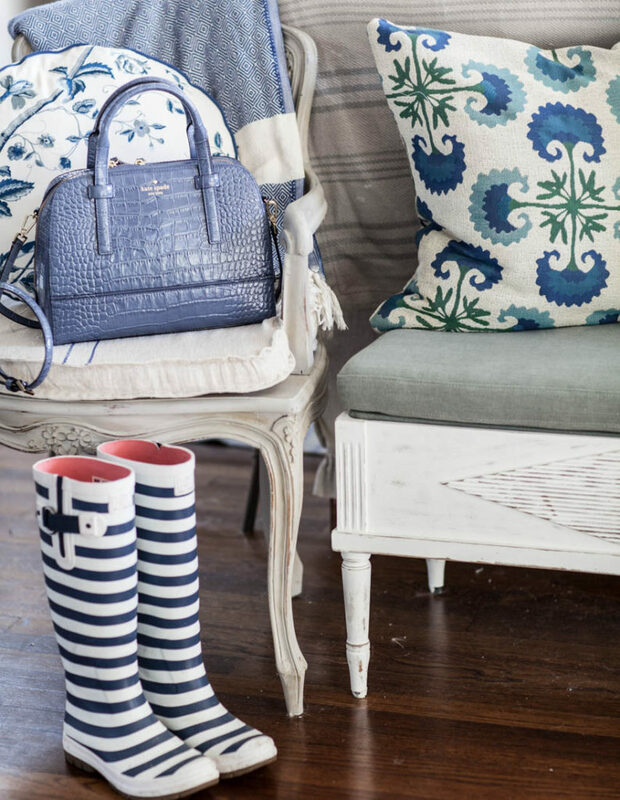 Great fabrics and love the bench behind the sofa….and must say, love that purse too! I love Calico fabrics too Shirley. Oh I went a bit crazy when Kate Spade had the big sale in December. Have a fabulous Valentine’s Day!! Looks like it is off to a great start. We have matching sofas facing each other in our open floor plan, I have often wondered what to do with the back of the sofa that is facing the front of the room. I look forward to listening to the podcast- Love the fabrics! Thanks Monique. I do love that layout with two sofas facing each other. you are FABULOUS! And such an inspiration. I never thought of putting a bench behind my sofa. I had a libaray table but I have since moved that to another room. so now I am on the look out for a bench! thanks for all your inspirational thoughts and ideas. you have inspired me more than you know!!! love your choice of fabrics and colors. thank you again!!! Hugs Deb. I’m so glad the information is helpful. I listen to Decorating Tips and Tricks every Monday, Wednesday and Friday. You ladies are fabulous!!! I love your bench and pillows but I think I like your sofa table better behind your sofa. 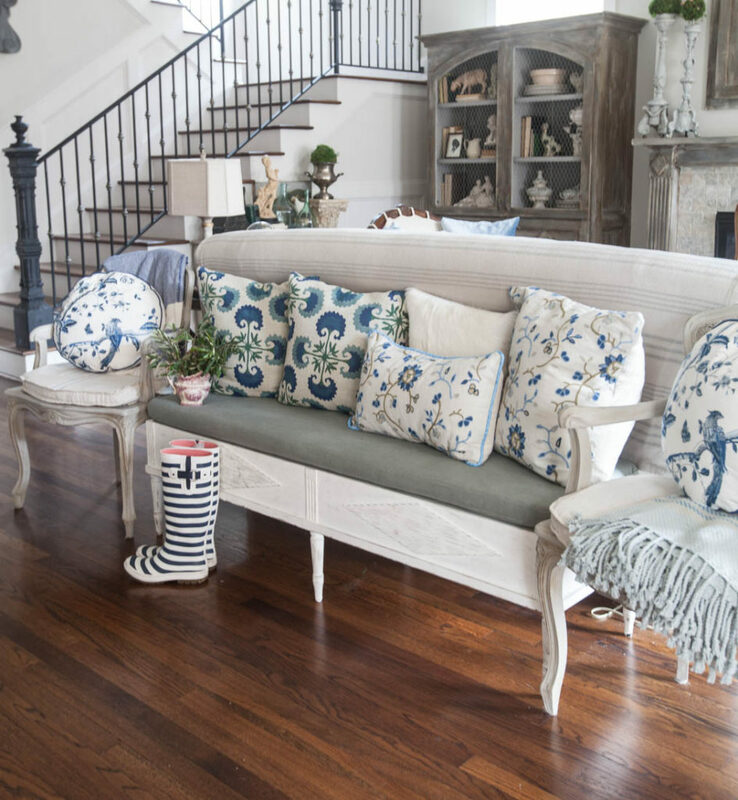 What about the bench along side the wall of your staircase? Where the sofa table is now? I know things always look different in person and it is always fun to try new ideas in our homes. Either is nice. Linda, the bench would be awesome over by the stairs! I can’t even see the furniture for the lavender Kate Spade purse! This is torture! If it happens to go missing, all of the items inside will be safely returned. Just saying………. I love what you have done with the bench behind the sofa but I think two of your pillows have fabric which is too contemporary design for your room. Your room has a lovely french look and feels so serene. I love the look which you have accomplished throughout your home. They are definitely more contemporary Patricia. Thanks for the feedback. So beautiful! I love it. Please tell me where I can purchase the round blue and white pillow? I just love it! Thank you. That is from Laura Ashley Jann. I love, love, and love this idea. Separate conversation spaces. And nicely done one. Jann, that pillow is from Laura Ashley. Mary, I love those boots too! They are from Nordstroms, Holly Hansen. They are from a few years ago. I like the bench better behind the sofa as well plus in the evening it gives reading light. Just sayin’!